Get 20% Off for VDAY! We heart local businesses! To show our undying love we are giving 20% off of any video production product! Hurry! Offer ends soon. I stumbled upon this video because I received a mailer offering me $20 off my first purchase. Having a tiny inkling of what Jet.com was due to a few commercials I had seen on cable, I hopped on the website wondering how I was going to save all of this hard earned cash of mine on every day products. Truth be told, when I got on the website I was a complete skeptic. I immediately defaulted to thinking it was another bidding website that is a complete waste of time. It was that self-proclaimed “healthy skepticism” that led me to searching out the “How Jet Works” tab at the top of the page. Thank you dear skepticism of healthiness, because it lead me to this pretty rad video. If a potential client has come to this video, they have most likely been to the site and want to know more information. We call this “expressing an interest.” You can get away with a longer video if it is for the intention of giving somebody more information that they are already searching for. This video, in particular, is much longer than the average suggested length of an explainer video. As a general rule, assume that when people see that the length of a video is really long they will skip out because ain’t nobody got time for dat in 2015. They have to get back to taking their selfies. However, I watched the whole thing in anticipation of what this guy was going to say next. Proof that content is key. 2. They cut multiple videos into one long video. Well… I wouldn’t say that this is “ok,” but while I would never suggest compiling multiple ads together, I actually loved that they did this. It only works, though, because the content is so clever that it kept me wanting more. I felt like I was waiting through the credits during a Quentin Tarantino flick for those extra thirty seconds of awesome. If your content is really funny and catches an audience, you may be able to get away with this. DISCLAIMER: Not my suggestion. But I did watch it till the end and was kind of bummed when it was over. Simple is great! Remember those Mac vs. PC ads? It was two guys on a white background, pretty much trash talking cleverly to each other. 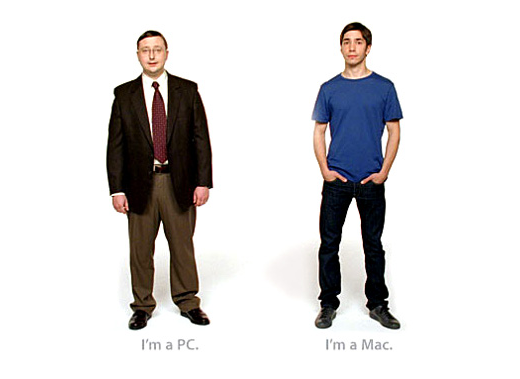 They created 66 of these ads and with the exception of paying for Justin Long (Mac) and John Hodgman (PC) to play the characters, this was a really low budget, amazingly effective ad campaign. Less is more sometimes, but never if it is chocolate. 4. It’s laced with sarcasm. Knowing your audience plays a massive factor in what you should be presenting in video. Actually… I take that back. Knowing your audience is the ONLY factor that matters when presenting ALL MARKETING MATERIALS. Personally, I’m a fan of the tongue in cheek, super honesty that sometimes presents itself as sweet sweet sarcasm. I also know that it’s not for everybody. The third thing I know is that I went to their site, watched and appreciated the video, and now will go ahead and use their service. 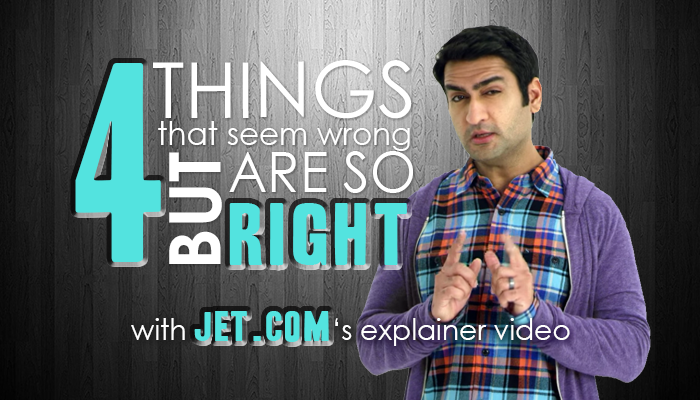 I am a target client for Jet.com and their sarcasm worked on me. Who is going to be viewing your video? Know your audience, think like your audience. When is your audience going to see it? Will they have already expressed an interest and be seeing the ad amongst other content before they have even heard of you? Where will they see your video? Will they have landed on your website and view it there? Will they be scrolling through Facebook and see a quick ad that catches their attention? Will they be on YouTube trying to watch a video of cats doing the Macarena and have to sit through five seconds of your ad first? EVERYTHING about your video production will revolve around those three things. To post the video that you use on your website as an explainer video for YouTube advertising would not be nearly as effective as crafting one specifically for the Who, What, and When of that platform… And that applies to all of them. So get to making those very specific videos for effective lead generation. And if you like what you see around here, feel free to follow me on Twitter or Instagram, connect on LinkedIn, check out WAKE brand media on YouTube… you get the idea. Shaina Churchfield founded WAKE brand media, a video production company focusing primarily on video content for web-based marketing strategies. Shaina has fifteen years of video production experience and a background in branding and digital marketing. She is passionate about connecting people, educating businesses, and genuine belly laughter. YouTube Advertising Production Rates That’ll Knock Your Socks Off! Creating video for your company is great. Knowing what do to with it is better. WAKE brand media provides strategic video production and innovative video marketing to make your content impact your target audience and make your marketing efforts as efficient and powerful as possible. With options for individual or subscription service video, we get you on a sturdy path to your dynamic, online presence. Oh ya, a fun little fact: Video is shared 1200% more than text and links combined. Shaina is passionate about connecting people and the visuals that get them there. Simplicity gets lost in marketing at times. She loves the look I get when I tell people to scale down and keep it simple. People want to do business with people. It's easy and video makes it easier.